Emerging Markets did particularly poorly. It is usually the case that those investments which go up the most when markets are rising often go down the most when markets are falling. iShares MSCI EAFE ETF (EFA) was down 0.93% during the second quarter, but still averaging 7.54% for the last 10 years. iShares MSCI Emerging Markets ETF (EEM) was down 10.00% during the second quarter, but still averaging 13.13% for the last 10 years. iShares MSCI Chile Capped ETF (ECH) was down 15.76% during the second quarter, but still averaging 5.14% for the last 10 years. iShares Core S&P 500 ETF (IVV) was up 2.90% during the second quarter, but only averaging 7.23% for the last 10 years and 6.96 for the last 5 years. Diversifying your assets outside of the United States is part of protecting your assets against all being subject to a single country’s economic failure or success. And the economic growth of the emerging markets is a good place to invest a portion of your assets for long term investing. 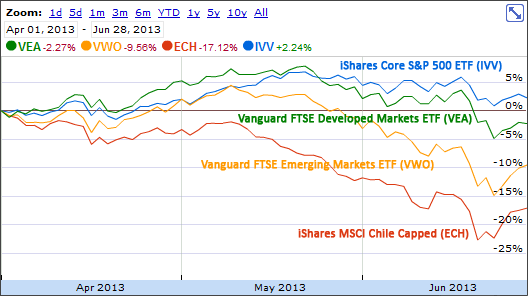 Which Emerging Markets ETF Should I Buy: VWO or EEM?